James Savage, A Genealogical Dictionary or The first Settlers of New England showing Three Generations or Those who came Before May, 1692 on the Basis of Farmer's Register, (1862) , vol. 3, p. 184. Find A Grave Memorial# 44702340. Rev. Samuel May, "Col. Joseph May, 1760-1841", The New England Historical & Genealogical Register and Antiquarian Journal, Vol.27, , at https://books.google.com/books?id=2bs-AAAAYAAJ . Boston: New England Historic Genealogical Society, (1873) , p. 113. 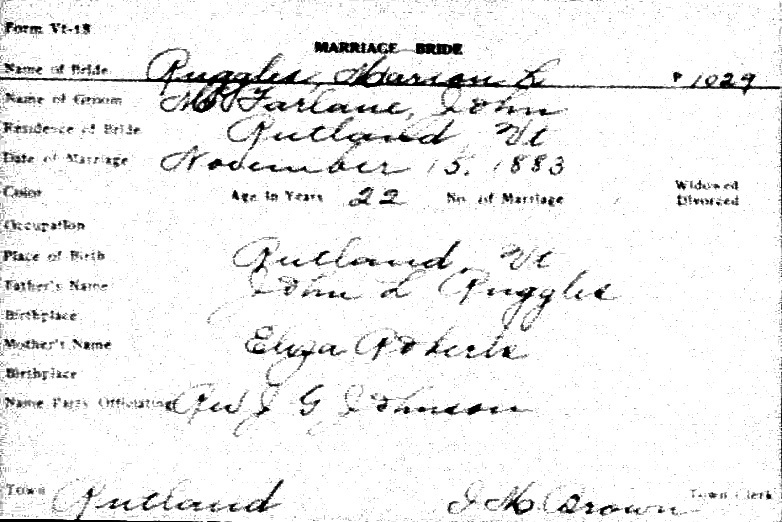 "Maine Marriages, 1771-1907," database, FamilySearch (https://familysearch.org/ark:/61903/1:1:F4FK-TP5 : 4 December 2014), James B. Adams and Emma F. Mayo, 13 Dec 1878; citing Milo, Piscataquis, Maine, United States, reference ; FHL microfilm 11,555. 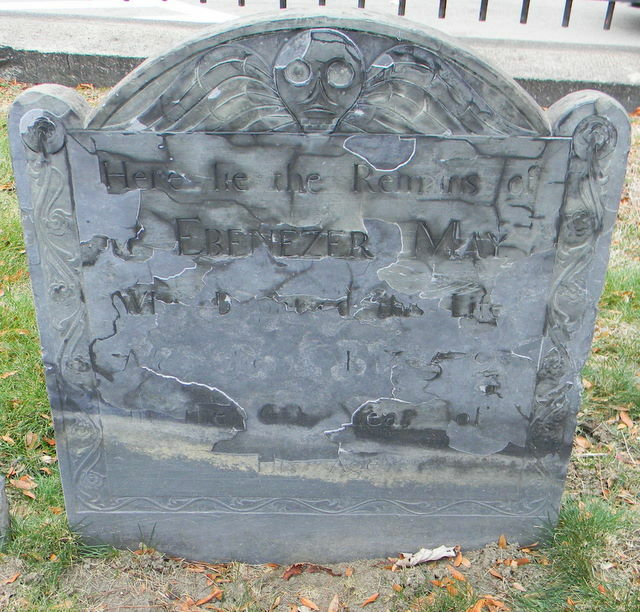 "Maine, Nathan Hale Cemetery Collection, ca. 1780-1980," database with images, FamilySearch (https://familysearch.org/ark:/61903/1:1:QVJ5-SPPX : 30 October 2014), James B Adams, 1892; citing Ogunquit, York, Maine, United States, Old Burying Ground Cemetery, Maine State Library, Augusta; FHL microfilm 1,314,438. "United States Census, 1880," database with images, FamilySearch (https://familysearch.org/ark:/61903/1:1:MFQZ-8SH : 14 July 2016), James D Adams, York, York, Maine, United States; citing enumeration district ED 211, sheet 671B, NARA microfilm publication T9 (Washington D.C.: National Archives and Records Administration, n.d.), roll 0492; FHL microfilm 1,254,492. "Maine Vital Records, 1670-1907 ", database with images, FamilySearch (https://familysearch.org/ark:/61903/1:1:2HV9-L87 : 27 December 2014), Ralph Edward Adams, 1882. 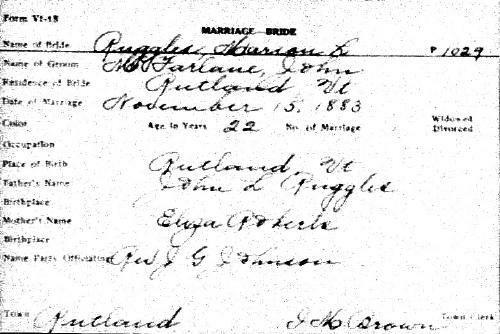 "Maine Marriages, 1771-1907," database, FamilySearch (https://familysearch.org/ark:/61903/1:1:F4XP-625 : 4 December 2014), George A. Adams and Jennie H. Mayo, 24 Nov 1875; citing ,Piscataquis,Maine, reference ; FHL microfilm 11,785.
living at Altoona, Eau Claire County, Wisconsin. 1930 United States. Bureau of the Census. 15th census, United States, 1930 federal census : population schedules ; NARA microfilm publication T626, Washington, District of Columbia: Bureau of the Census Micro-Film Laboratory, ([19--?]) , Census Place: Altoona, Eau Claire, Wisconsin; Roll: 2572; Page: 10B; Enumeration District: 1; Image: 22.0. THURSTON/BARTHOLOMEW/KENYON Gedcom file of Online Family Tree, Ancestry.com, Inc., 266 W. Center, Orem, UT 84057, (801) 426-3500, online 126791.ged, (http://www.ancestry.com), created 02 Jun 2000. "Vermont Vital Records, 1760-1954," database with images, FamilySearch (https://familysearch.org/ark:/61903/1:1:XFQ7-5LQ : 6 December 2014), John Mcfarlane and Marion L. Ruggles, 15 Nov 1883, Marriage; State Capitol Building, Montpelier; FHL microfilm 540,140. "Vermont Vital Records, 1760-1954," database with images, FamilySearch (https://familysearch.org/ark:/61903/1:1:XF4C-4B9 : 6 December 2014), John Mcfarlane and Marion L. Ruggles, 15 Nov 1883, Marriage; State Capitol Building, Montpelier; FHL microfilm 540,119. "United States Census, 1900," database with images, FamilySearch (https://familysearch.org/ark:/61903/1:1:MMP3-YHW : accessed 9 December 2016), John L Ruggles, Rutland city, Rutland, Vermont, United States; citing enumeration district (ED) 185, sheet 13A, family 273, NARA microfilm publication T623 (Washington, D.C.: National Archives and Records Administration, 1972. ); FHL microfilm 1,241,694. "Vermont Vital Records, 1760-1954," database with images, FamilySearch (https://familysearch.org/ark:/61903/1:1:XFQ2-NRX : 6 December 2014), John Ruggles Mcfarland, 18 Jan 1891, Birth; State Capitol Building, Montpelier; FHL microfilm 540,119. Record added: Apr 24, 2013.